Posted: Tue Nov 13, 2018 9:59 am Post subject: THE LAST CLAUDE GORDON ESTATE CG SELMER TRUMPET IS FOR SALE! Well it's been about five years since Claude Gordon's Big Bear California Estate Auction at the HARD ROCK CAFE in TIME SQUARE, NEW YORK featuring CG in between Michael Jackson and the Beatles in their MUSIC ICONS catalog !! and I can't believe how fast the time has gone by. I have dispersed most all of the contents I purchased then, Through Julien's Auctions in Beverly Hills, Ca., eBay, and several of the members here, as well as large donations of artifacts and correspondence to Jeff Purtle etc. I also kept a few items for my personal collection including 1 of the 9 trumpets left in CG's estate. Thank you to all that were involved Especially Dave Evans, for without his help and willingness, it would not have been possible to say the least. A beautiful and rare trumpet indeed! We postponed it one day. see my last post for details. Thanks for letting us know! Note though that this horn you are selling was not one of Claude's personal trumpets. The serial number shows it to have been manufactured after Claude died. 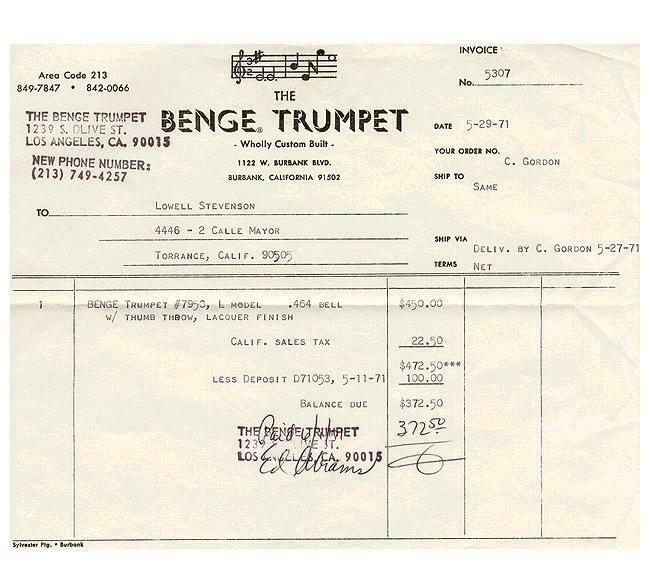 It is among the (new) horns that Patty was selling on the Claude Gordon Music Enterprises website. About a year after Claude died I purchased a new CG Selmer from Patty in early 1997 and that horn is serial number 001724. From the serial number (002030) of the horn you are listing on eBay it is clearly one of the last CG Selmers made, and it is likely one of the horns I play-tested for Patty and approved of (those that I didn't like were returned to Bach/Selmer and then presumably sold by other dealers). Thank you for the information John Mohan. I have spoken with a few of you that were close to Claude, (as were you) and they give similar accounts of what you are saying and an invoice that is included in the listing back that up as well. It is said that this horn was tested & to be used as a prototype for another company (that Patty chose) to produce their version of the CG Trumpet. Thank you for clarifying. None the less, from what you have all said, this is what appears to be a superb horn and is in fact from Claude's Big Bear Estate. Whether he actually played it, You all would know far better than I. Again thank you John Mohan, and to everyone else that I have spoken with in the last week or two. The love you all share for this man is truly incomparable. I saw a review that the Selmer had thin material and flimsy bracing and valve block/thin buttons.....and that most staunch CG disciples believe the best versions of his horn were made by Zig and Benge. Not all, but most. The sound of the Benge was thicker, more sonorous and had more core, than the Selmer sound, which was bright and thin. I just finished playing my Selmer CG for a couple of hours. "Thin" is not an adjective I would use to describe it. It is relatively bright, in comparison to, say, a Bach 18037, but it's not "thin" at all. I have never played a Benge CG, so I cannot comment on their comparative qualities. I beg to differ about the comparison of the CG Benge and CG Selmer. I have both. My CG Benge should be a good one because it was Claude's gift to his son Gary and plays great. I have played Harry Kim's CG Benge trumpets alongside my CG Selmer and think I have an understanding of the two. The CG Benge has a slightly smaller bell diameter, which I believe gives it slightly smaller sound. I would describe the CG Selmer as having a bigger sound that feels less directional. However, when someone gets used to the equipment their sound takes on more of their personal quality. Harry Kim sounds better playing his CG Benge vs my CG Selmer and agreed before that I sounded better on my CG Selmer than his CG Benge. 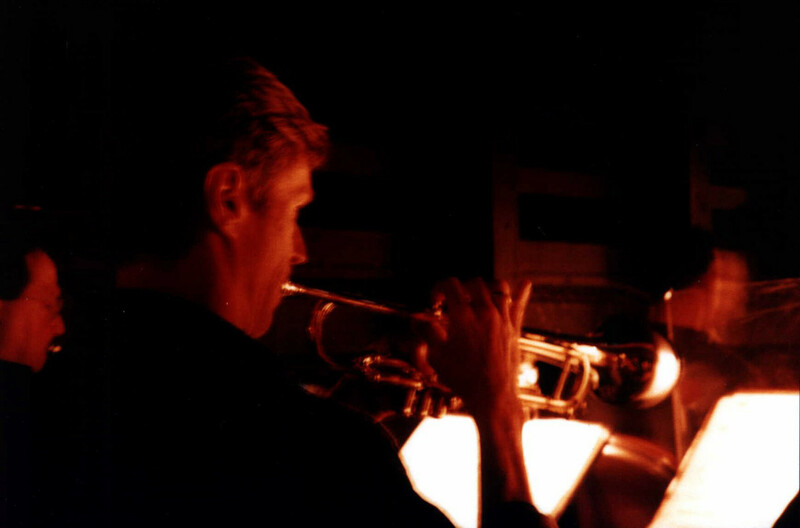 My primary trumpet has been a CG Selmer since 1984 and Harry has played a CG Benge since the first ones in the 1970s. As an odd side note: When I received my CG Benge it had an experimental mouthpiece in the case that was a CG Benge 7 mouthpiece that had a cup deeper than most flugelhorn mouthpieces and the the shank was sanded to be thinner and the shank was also cut about half an inch shorter to bring it up to pitch and make it the trumpet receiver. When I put that mouthpiece on the CG Benge it played exactly the same as my CG Selmer with CG Personal mouthpiece. The tone was as full as the CG Selmer. The response between the CG Benge and CG Selmer seem the same when I use my CG Personal on either one. The resistance and everything feels so similar I could easily play either one and never think twice. I prefer the sound of the CG Selmer. They are great playing horns and I love them both so much that I am never happy when trying any other horn at events like the ITG conferences. I'm definitely an equipment junky guy. I'm satisfied with what I have and know that I just need to get to my practice and forget about anything else. Btw....Harry Kim now plays a 1950 Chicago Benge large bore...he has 2 of them. Hehehe. That’s for now. I know Harry pretty well and just stayed at his house at the end of October to hear the final Phil Collins concert at the Los Angeles Forum. Give it a year and he might back to the CG Benge. He has several and has tried other things like the Bach Artisan and then went back to the CG Benge. Sorry to be replying a bit late, but I've been kept busy with school and all. That sounds like a very inaccurate review of the Selmer! For one thing, the bracing on them is exactly the same as that of the Bach Stradivarius and I've never heard anyone accuse the Stradivarius of having "flimsy bracing". Unlike the Bachs, the CG Selmers were completely hand built (as per the agreement between Claude and the Selmer corporation) and that, while being a great thing as far as build quality and performance, in the long run, ended up being the horn's undoing as Bach/Selmer priced them the same as their Bach Strad line even though they cost much more to build. As for the thin valve caps, that design aspect was to make them even lighter weight and that's a good thing - this is part of what contributed to the very fast valves of the CG Selmer. If I was going to be playing Flight of the Bumble Bee or any other piece that flies, I'd choose one of my CG Selmers over either of my CG Benges every time. The valves on the typical CG Selmer are smoother than the typical Benge (though either can be tweaked by having the valve cylinders relapped and the pistons nickel plated). Also, the valve throw on the Selmer is shorter than the rather long throw of the Benge. I purchased my first CG Benge in 1980 through Claude Gordon via Zep's Music in Los Angeles. My horn was custom built to Claude's personal specs at Benge (lacquer, concave finger buttons and no thumb throw - hated thumb throws!). And it was play-tested and approved of by Claude prior to my purchasing it. As such it was as good or better than any other CG Benge. The valves were not good on it. Within the first year of ownership I took it to the Schilke factory and they redid the valves and they've been fine ever since. Playing wise I was very happy with it - until I bought my first CG Selmer (again, through Claude) in 1985 or so. The CG Selmer was more lively, brighter, and the valves worked flawlessly from day one. But there is a caveat: A few years later Bob Malone was in the middle of doing a rebuild of my CG Benge for me, when he closed his shop and moved away from California to go work with Yamaha. He had only gotten as far as stripping off the lacquer and getting rid of the few dents the horn had. He needed to clear his shop out and was nice enough to not charge me for the work he had already done. He even buffed the horn the day I came to pick it up so it looked perfect (but still in bare brass). When I played it I was amazed. It played nicer, brighter, and just felt easier - more sound for the same amount of effort. It now played almost exactly the same as my (silver plated) CG Selmer, with the sound being just a little less bright, or more warm (choose the wording you like best). So in summary, most of the reason I originally preferred my new CG Selmer over my older CG Benge was actually caused by the lacquer finish on the Benge. That said, throughout my years touring with Circuses (mid to late 1980's), most of my LA Studio years (early to mid 1990's) and most of my years playing on sit-down musicals in Germany (late 1990's to mid 2000's) I did my work on my CG Selmer (later, on my second one I purchased from Patty Gordon in 1997 and then had gold plated). I did find and buy the rather unique Burbank Benge Large Bore from fellow CG student Lowell Stevenson in 2001 that has the reduced Bell Pipe diameter and thinner brass of the soon-to-be-introduced CG Benge (two of the three main things that were done to the Large Bore Benge design in the creation of the CG Benge). This Burbank Benge 6X was ordered by Claude from the Benge company with the specified reduced (.464") bell tube in May 1971 and can be considered a prototype for the soon to be introduced CG Benge. I love the Burbank, it has been my main horn since 2001, and I still can't believe Lowell wanted to sell it! The Burbank Benge plays a little darker than either of the two CG designs (probably due to its stock Benge leadpipe with the comparative smaller venturi diameter than that of the CG trumpets). The high notes require more effort than those on the CG designs (again, probably due to the larger venturi on the CG designs that was copied from Claude's personal Pre-WW2 French Besson Meha trumpet that he used through most of his Studio years). Note that although my Burbank 6X Large Bore plays a little darker than the CG Selmer or CG Benge, it is still a bright trumpet compared to most Bachs, Schilkes, Yamahas, etc. When I need an even brighter sound for Big Band lead, a show like Cat's, or playing in a rock and/or funk band, I pull my CG Selmer out. In summary, anyone who finds and plays a CG Selmer or a CG Benge that is in good condition (or the current Kanstul-made Burbank 6XCG) is going to be playing a wonderful trumpet with a nice, big, bright sound and high notes that are noticeably easier to play than on other typical pro-level trumpets.